It wants to bring desktop-class speed and graphics into ultrathin notebooks. It's been a revival year for AMD. Its Ryzen chips thrust it back into the desktop arena -- so much so that it practically forced Intel to dramatically ramp up the capabilities of its upcoming eighth generation Core CPUs. And with its RX Vega video cards, AMD finally had a way to compete against NVIDIA's latest batch of GPUs. Now, the company is setting its sights on laptops with its upcoming Ryzen Mobile chips. And, as you might expect, they'll feature integrated Vega graphics. AMD's goal? To power ultrathin laptops that can still play a few rounds of Overwatch. Although AMD is no stranger to laptops, it's never been a market where the company truly shined. Last year's seventh-generation APUs (its term for processors that combine CPUs and GPUs) helped it catch up with Intel. But with Ryzen Mobile, AMD is looking to leap far beyond the competition. The company claims it delivers desktop-class CPU performance, and its integrated Vega graphics are about as powerful as NVIDIA's GTX950M dedicated GPU. 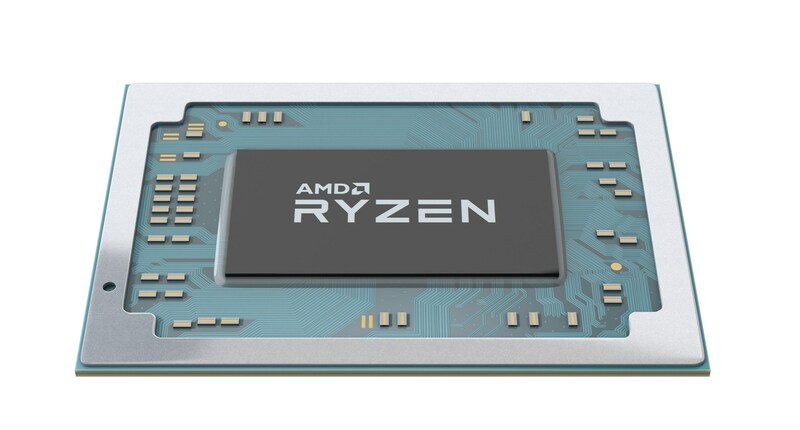 To start, AMD is launching two new mobile processors: the Ryzen 7 2700U and Ryzen 5 2500U. Both chips will pack in four cores with eight threads -- just like Intel's eighth-generation laptop processors. The higher-end Ryzen 7 will feature clock speeds between 2.2GHz and 3.8GHz, and it'll pack in 10 Vega cores. The Ryzen 5, meanwhile, will see between 2GHz and 3.6Ghz speeds and eight Vega cores. In comparison, Intel's new chips can reach up to 4.2Ghz, but its integrated graphics aren't nearly as powerful. Even when pitted against Intel's Core i5-7600K -- a powerful desktop chip -- the Ryzen 7 mobile processor won out, reaching 707 compared to Intel's 662 in Cinebench's multithreaded benchmark. That's even more impressive when you consider the Intel chip has a high 91-watt thermal design profile, or TDP, which means its meant to withstand much more voltage. The Ryzen 7's TDP is a mere 15 watts. As for pure GPU performance, Ryzen Mobile blows away last year's chips, as well as Intel's current integrated graphics. In 3DMark Time Spy, the Ryzen 7 reached a score of 915, while Intel's Core i7-8550U scored just 350. You'd have to combine an Intel chip with NVIDIA's 950M dedicated graphics to get anywhere close. Of course, AMD isn't directly comparing itself to NVIDIA's 10-series mobile GPUs, which deliver astounding desktop-like performance. But that makes sense. Those graphics cards are dedicated components, not integrated directly with a CPU like Ryzen Mobile. At this point, AMD is basically trying to push what's possible with thin laptops and mid-range gaming. And though the company isn't saying much about future plans yet, reps noted that it wouldn't be difficult to scale Vega's performance in laptops to directly compete with NVIDIA's fastest hardware. Although Ryzen Mobile machines certainly won't replace dedicated gaming machines, they're fast enough to satiate gamers on the road. AMD claims the Ryzen 7 chip gets around 59 frames per second in League of Legends while playing in 1080p. Overwatch, meanwhile, scores a respectable 66 FPS in 720p with low settings. The new laptop chips also sport several beefed-up features. AMD's Precision Boost 2 technology lets them scale down their clock speeds gracefully as more threads are required. Previously, there would be a big speed dip as you needed more processing threads. AMD describes its new technology as more opportunistic -- it'll take as much performance as it can get depending on the current temperature, voltage and load. Additionally, the company's new mobile XFR technology lets well-cooled laptops sustain peak clock speeds for much longer than before. Turning that feature on gave the Ryzen 7 a 23 percent speed boost in Cinebench's multithreaded benchmark. And of course, there's battery life. AMD claims you'll see up to twice the performance of last year's chips, according to its reference benchmarks. Ryzen Mobile gets over nine hours of YouTube video viewing on a test system, compared to 4.5 hours for the previous generation. MobileMark 14, which recreates typical laptop usage, saw around 13.5 hours of battery life, whereas the last generation saw 10.7 hours. These figures are just meant to give you a sense of the improvement, though. Actually battery-life times will depend on the hardware manufacturers actually use in their systems. You'll find the Ryzen Mobile first in HP's Envy X360 convertible, Lenovo's Ideapad 720S and Acer's Swift 3, all of which are being refreshed later this year. AMD points out it's relatively simple to integrate the new chips into existing laptop designs. In fact, it can get some serious performance boosts when it's placed into cooling systems meant for much hotter chips. The Ryzen Mobile chips are also 24 percent thinner than before, which means it'll fit into thinner systems. Given that AMD is typically known for its mid-range and low-end laptop chips, it feels strange to be genuinely excited about what its next processors mean for high-end laptops. Who wouldn't want a machine that's as thin as a MacBook Air that you can also use for a bit of gaming? Ryzen Mobile, in particular, is something only AMD could build. Intel has faster desktop chips, and NVIDIA has faster dedicated mobile graphics. But nobody else could combine the strengths of both into a single mobile-ready processor.